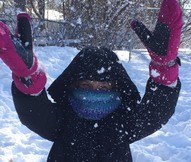 Winter break has officially begun! There will be no school for students Dec. 24 through Jan. 1. All district buildings will be closed Dec. 24 and 25 and Dec. 31 and Jan 1. Students and staff will return on January 2, 2019. Have a safe and happy winter break! We look forward to welcoming you back in 2019! School board members voted to approve $1.081 million in budget adjustments for the 2019-2020 school year. The approved list includes a reduction in the areas of professional development and curriculum development, cuts to administrative positions, reductions to supply budgets and facility maintenance, and increased fees for facility rentals. The approved list varied slightly from the recommendation board members were considering, which included a total of $1.523 million in reductions. Read more and view the list. Want to know what else was discussed at the most recent school board meeting? Check out the Board Meeting Notes from Dec. 20, 2018 online. Members of the National Junior Honor Society at Oak-Land Middle School are sending hand-made friendship bracelets and birthday cards to children and the elderly in Honduras. It's a project they're calling Happiness for Honduras. The gifts will travel with eighth grader Alaina Peterson as she, her mom and a group of missionaries visit Honduras in January. 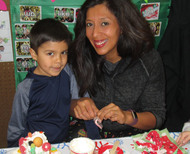 Kindergartners in Kim Schneider's class decorated gingerbread houses. They spent the past few weeks reading and comparing stories about the gingerbread man, boy and girl. The students capped off the lessons by inviting one special guest to help them build their own gingerbread house. See more photos on Facebook. Stillwater Area High School journalism students surprised their teacher Rachel Steil with a special visit from her favorite reporter, Boyd Huppert from KARE 11 News. Watch the video. 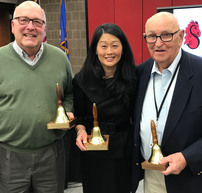 School board members George Hoeppner, Don Hovland and Paula O'Loughlin attended their final school board meeting this week. Together, the three served the district as board members for more than 15 years. Please join us in thanking them for their efforts to improve learning for all of our students in the Stillwater Area Public Schools. Newly-elected board members Mark Burns, Tina Riehle and Liz Weisberg will be sworn into office during the Jan. 3 board meeting. Each year, we collaborate with The Partnership Plan to honor distinguished grads who have made the community proud. Nominate someone online. The deadline is Feb. 17, 2019. 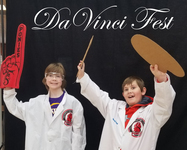 Join us for Da Vinci Fest on Saturday, Jan. 5. With more than 40 exhibitors, special performances, the new upcycling fair, our favorite ice sculptor, a life-sized totem display, a live podcast, music, improv, The Stillwater Science Challenge, dance, droids, solar-powered robotics, there's something for everyone at this free, community wide event! Join us from 1-5pm at Stillwater Area High School. Jan. 16: Preschool open house at ECFC and all elementary schools from 5:30 to 6:30 p.m.